The Raygun Girls are just a little misleading. At least, their name is. While upon first hearing of them, one might tend to assume they're a girl punk band, it turns out that only one of Girls is female. And the band's sound leans more toward Sisters of Mercy and Lacuna Coil than Sleater-Kinney or The Lunachicks. But band founder, Geoff, asks that you not assume that they're just another cookie-cutter goth/industrial band either. Currently touring the ultra-competitive New York music scene, The Raygun Girls have been making their mark through strong live performances, proving that one can be simultaneously dark, heavy and catchy. Created by Geoff and Jamie in early 2000, the band was formed with the goal of making danceable music with a guitar influence. "At the time I was getting into Rammstein and listening to the Clay People and Fear Factory," said Geoff. "I love heavy music, but with drum samples and keyboards one can add so much more!" 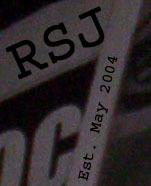 It was these varied interests that resulted in The Raygun Girls' debut, Mars Eclipsing, which has been praised for its combination of dark, gothic elements with catchy riffs and lyrics. Geoff cites one of favorite bands as a source for the variety in The Raygun Girls' sound. "I keep seeing the band's over-all sound as a reflection of the heavy influence that Killing Joke has had on me. They've got punk, Goth, metal, industrial, all mixed into their sound, and that's what we do." Though the band began as a studio only creation, it soon grew into a live band, complete with bassist George, whom Geoff had worked with formerly in punk group The Orgasmabots. More than just a live player, however, George has begun to contribute to the songwriting process as well. "We all have a say in the songwriting and put in our input to tweak and/or change the song," said George. "Sometimes if Geoff is stuck, I write the lyrics or the bass line." 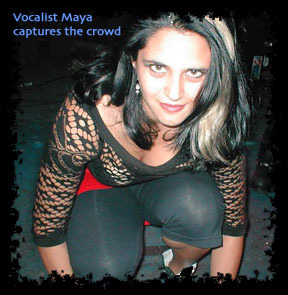 Both Jamie and original singer Janine Innamorato departed the band in early 2004, but the void was filled by Maya, who took over vocal duties as the band began to play regularly throughout New York. "The music sounds much better and more aggressive live; we don't just stand there stoic playing our instruments," said Geoff. "And you don't know what Maya's going to wear...or not wear." While Maya admits to having fun with costumes, she feels that the show's real sexual energy comes from the performance, not the clothes. "What I hear most about the show is that there is an intriguing sexual tension between us on stage," said the vocalist. "I've heard debates about which of my bandmates I'm sleeping with. Mostly, I just love getting lost in the songs and letting them come through me that way. Sometimes it makes me forget I'm on stage." Maya's sultry vocals are an aspect of the music Geoff plans to emphasize as the band works on new songs. "Mars Eclipsing is more of an electronic based album, because of the way we wrote the songs. The [new] songs are heavier, with more of a focus on Maya's vocals, and they've still got a great groove to them." Though The Raygun Girls are working on new material, they don't plan to rush back into the studio just yet. "We like to play our songs a few times and get familiar with them before putting them down on an album. Right now we're playing about five new songs in our set and we're about to add another one," said Geoff. "You get a better feel for a song after playing it a lot; come up with better guitar parts, or shorten or lengthen sections." When they do get new material out, it will most likely find a home on Geoff's own label, Savage Vibes Records. Originally created with the purpose of having a label name to put on Mars Eclipsing, Savage Vibes has become a graphic design and cd duplication service, as well. "We're a label in the sense that we will sell your album, we'll listen to your music and give you our opinion on it, and we have duplication services with on-cd color printing." Geoff doesn't rule out the possibility of operating Savage Vibes as a full-scale label in the future, saying that "ultimately, I would love to be able to run a true label, and finance bands. There are so many bands out there that are making great music, but just don't have a focus or are very disorganized, and so they play shows they shouldn't be and end up wasting their money. It's misdirected energy, which I think I would know how to focus to get the best bang for the buck." 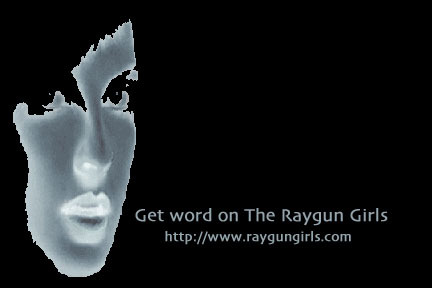 But for now, his energy is spent spreading word about The Raygun Girls, a focus shared by his bandmates. "Getting your name out there is the most difficult," said George. "As musicians, we want to focus on the music, not the rest of the 'business,' but that's necessary and stressful so it has to be done." "By us not fitting into a certain genre, we have to make one up, which makes it hard for concert-goers to know what we sound like by just reading the label," said Geoff, who, despite seeing where this is setback also feels that the band's originality is the best reason for picking up the cd. "There's a great mix of all types of songs on the album, from guitar-driven hard rock to melodic spooky Goth." "It's a great record and fun to listen to in that car at 80," concurs George. "Sing along, it's fun, I do. Sometimes I do at shows, but that makes Geoff upset (ha ha)."